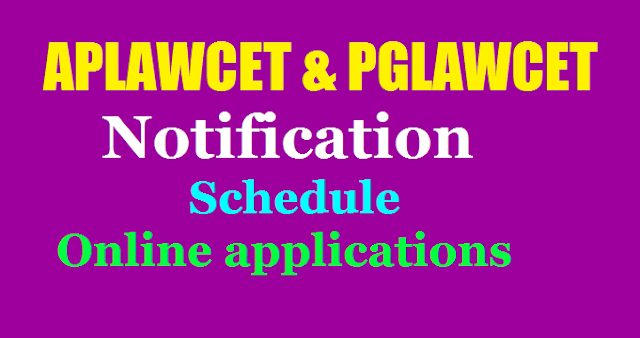 APLAWCET & PGLAWCET-2019 Notification Schedule online applications https://sche.ap.gov.in/lawcet : SRI KRISHNADEVARAYA UNIVERSITY ANANTHAPURAMU A.P.Common Entrance Test (AP LAWCET & PG LAWCET-2019) will be conducted on 06-05-2019 from 2.30PM to 4.00PM for admission into regular LLB course (3 Years & 5 Years) & LLM. course (2 years) for the academic year 2019-20. Eligible candidates can submit their applications through online mode only, by paying the application registration and processing fee of Rs.750/- for LLB Course and Rs.850/- for LLM Course, through AP Online Payment gateway (Credit Card/Debit card and Net banking). The detailed information regarding eligibility. syllabus and test related instructions and procedure for Online Submission of Applications are available on the website https://sche.ap.gov.in/lawcet AP LAWCET 2019 Notification, Schedule, Online Application Form, How to Apply, Fee Details, Last Date, Onine AP LAWCET Exam date, Hall Tickets, Results, Admission Counseling details are given here. In terms of G.O.Ms. No.26, Higher Education (H.E.II ) Department, dated 24-3-2004 and G.O.Ms. No.52, Higher Education (UE-II) Department, dated 20-6-2007 and their amendments, issued by the Government of Andhra Pradesh, the competent authority, Chairman, APSCHE has entrusted the job of conducting the entrance tests APLAWCET and APPGLCET for admission into first year of 5-year LL.B / 3-year LL.B and first year of Postgraduate Law courses LL.M / M.L respectively to Sri Krishnadevaraya University, Ananthapuramu, Andhra Pradesh. 3 year LL.B Course: The Candidates for 3 year LL.B. should have passed any Graduate Degree (10+2+3 pattern) of a recognized University with 45% of aggregate marks or any other examination recognized as equivalent by the Universities concerned. If any candidate secured less than 45% in graduation he should have passed any additional graduate or postgraduate degree with 45% aggregate marks. Note: There is a relaxation of 5% of marks in the above qualifying examinations for 3 year / 5 year Law course in favour of the candidates belonging to SC / ST and relaxation of 3% of marks for candidates belonging to other backward classes. 2 Year LL.M. Course: Candidates holding LL.B./B.L. degree on the date of application and candidates who have appeared/appearing for LL.B./B.L. Final year examination are also eligible. A candidate appearing for LLB/BL degree examinations may take the AP PGLCET in anticipation of results. However the candidate shall have passed the qualifying examination with 50% marks in aggregate (for OC/BC) and 45% marks in aggregate (for SC/ST) at the time of counseling. Medium of Entrance Test: The APLAWCET will be conducted in English and Telugu versions and APPGLCET question paper will be in English only.